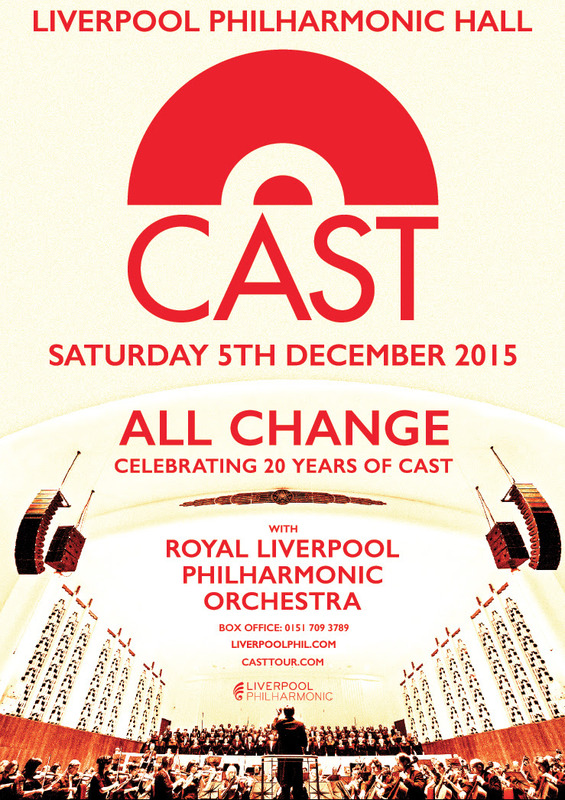 To celebrate the 20th anniversary of the classic album ‘All Change’, Liverpool band Cast will unite with the Royal Liverpool Philharmonic Orchestra for a special live performance on Saturday 5th December 2015 at the historic Liverpool Philharmonic Hall. Originally released in 1995 following John Power’s song writing experiments with The La’s, the multi-platinum debut album spent more than a year in the charts and found its way into the hearts of millions. 20 years later and hits like Finetime and Alright have become classic anthems, lead guitarist Liam ‘Skin’ Tyson now also plays with the legendary Robert Plant (Led Zeppelin) and this unique celebration of Cast’s music, combining their energy and formidable live performance with the oldest surviving symphony orchestra in the UK, is a unique chance to hear all the hits like never before. Expect to hear ‘Walkaway’, the emotional soundtrack to Euro ’96 and Cast’s first single featuring string arrangements, alongside many others from their vast back catalogue of hits and album tracks including ‘Flying’, ‘Guiding Star’ and the David Arnold (James Bond soundtrack composer) arranged ‘Magic Hour’. The 20th anniversary will be a unique chance to hear the now classic songs and album tracks alongside original and new orchestral arrangements by the Royal Liverpool Philharmonic Orchestra. It’s almost worth waiting 20 years for.